Flyers rookie center Nolan Patrick (19) gets knocked down by Tampa Bay defenseman Victor Hedman after scoring his 10th goal in the first period Saturday. TAMPA – Defensive lapses and shoddy goaltending by newcomer Petr Mrazek prevented the Flyers from holding 3-1 and 5-3 leads Saturday afternoon at the reverberating Amalie Arena. The Flyers salvaged a point, but they lost a wild 7-6 decision to Tampa Bay as Steven Stamkos iced the verdict with his team's second goal of the shootout. The Flyers missed a chance to equal a franchise record with their eighth straight road win. Still, they managed a point against the NHL's best team, thanks to Claude Giroux's goal with 2 minutes, 53 seconds left in regulation. Hustling defenseman Ivan Provorov, who finished with a goal and two assists, poked a pass to Giroux to set up the tally. "That was a pretty fun game to play," Giroux said. "They have a lot of talent and a lot of players who can make a difference. You give them chances to score, and they will." Stamkos finished with five points, including a pair of goals, and defenseman Victor Hedman contributed a pair of goals and two assists. Travis Konecny and Shayne Gostisbehere (twice) were robbed of goals early in the overtime. The Flyers failed to score on a four-on-three overtime power play. 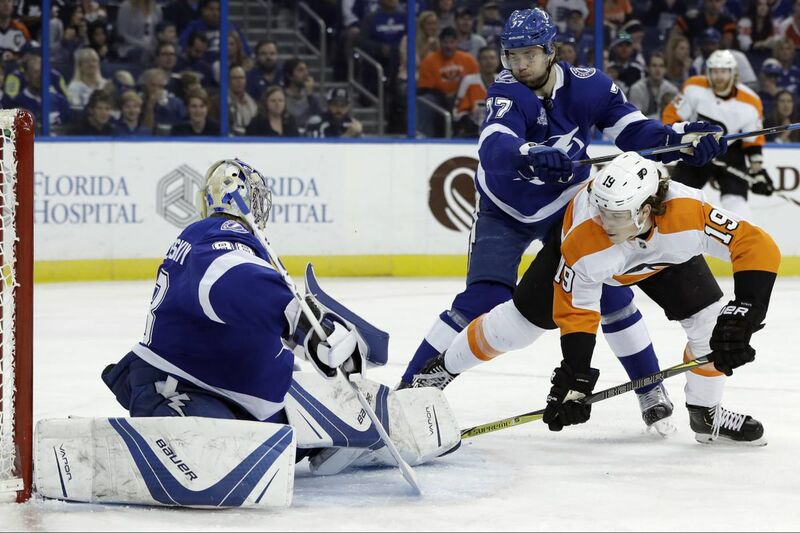 After the game, Gostisbehere was still shaking his head about Andrei Vasilevskiy's sprawling save on him when the Flyers had the overtime power play. "I had an empty net there and he made an unbelievable save," Gostisbehere said. "That's why they are where they are, they have some great goaltending, great players. Obviously we wanted the two points, but not bad to get one." Trailing 5-3 early in the third period, the Lightning scored three goals in less than six minutes to take a 6-5 lead before Giroux's late tally. "I think we did a good job of keeping our composure," Giroux said. "Even when there were times they came at us pretty hard and were moving it around pretty good, we stayed composed and the next shift we kind of moved on." Tampa Bay took a 6-5 lead after Hedman scored from the high slot following a Flyers turnover with 9:57 left in regulation. A little over two minutes earlier, Stamkos finished off a two-on-one to knot the score at 5-all. After Provorov gave the Flyers a 5-3 lead early in the third period, J.T. Miller scored on a juicy rebound allowed by Mrazek, getting the Lightning to within 5-4 with 15:37 left in regulation. The Flyers, who had an extra skater because a delayed penalty was going to be called on Tampa Bay, took a 4-3 lead when Jori Lehtera, of all people, fired a right-wing shot that went through the legs of Vasilevskiy with 3:45 left in the second. It was the second weak goal allowed in the game by Vasilevskiy, who has a league-high 38 wins. Tampa Bay had tied the score at 3-all when it took advantage of a Provorov miscue as Dan Girardi scored on a point drive with 7:13 left in the second. About seven minutes earlier, Hedman tried to throw a pass out front, but it took a fortuitous bounce off the skate of Flyers center Val Filppula and fluttered past a stunned Mrazek to get the Lightning to within 3-2. Earlier, Jake Voracek (two points) capitalized on a turnover by former Flyers defenseman Braydon Coburn and scored on his own rebound, and defenseman Robert Hagg scored on a wrist shot from the high slot as the visitors built a 3-1 first-period lead. Nolan Patrick chipped in with a goal and an assist. Mrazek was shaky in the third period and he allowed goals on two of three shootout shots as he fell to 1-9-1 in his career against Tampa Bay. "I have to be better," Mrazek said. "…We score six on the road, we have to win that game." Based on Saturday's play, goalie Alex Lyon and defenseman Johnny Oduya might be in the Flyers' lineup Sunday afternoon at Florida. Giroux (652 career points) moved ahead of Tim Kerr and into sixth place on the Flyers' all-time scoring list…..Patrick's tally, his seventh in the last 16 games, gave the Flyers 11 players with at least 10 goals. … Struggling winger Jordan Weal, who was a healthy scratch Thursday, returned to the lineup and was on the fourth line with Filppula (two assists) and Lehtera. Weal had an assist on Lehtera's goal, giving him three points in his last 20 games.